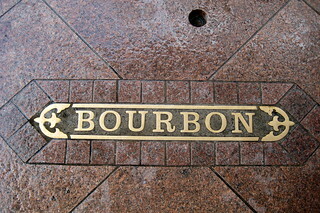 Bourbon Street, or Rue Bourbon, starts at Canal Street and runs downriver through the length of the French Quarter and coming to a terminus at Pauger Street in Fabourg Marigny. The street was named in honor of the House of Bourbon, the ruling French Royal Family, at the time of the city’s founding. When New Orleans was the Capital of the Spanish province of Luisiana, from 1762-1803, it bore the name Calle de Bourbon. The most frequented section of Bourbon Street is Upper Bourbon Street, an eight-block stretch of bars, restaurants, strip clubs, and souvenier shops. Starting at St. Ann Street and proceeding several blocks northeast, it caters to New Orleans’ thriving gay community. From Dumaine Street to Pauger, Bourbon Street is largely residential with scattered businesses still catering to locals. Bourbon Street is known for its festive atmosphere, particularly at night and during the French Quarter’s many festivals, including Mardi Gras, the French Quarter Festival and Southern Decadence. Without open container laws, the streets are usually packed with tourists imbibing on everything from Hurricanes and Hand Grenades to beer.